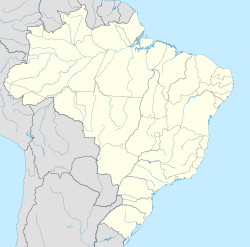 Contagem (Portuguese pronunciation: [kõˈtaʒẽj]) is a ceety in the centre o the state o Minas Gerais, in Brazil. It is locatit anerlie 21 kilometers frae the caipital, Belo Horizonte an forms pairt o a metropolitan aurie wi a population o 4.8 million. The ceety belangs tae the mesoregion Metropolitana de Belo Horizonte an tae the microregion o Belo Horizonte an haes a territorial extension o 195.2 km² an borders the municipalities o Ribeirão das Neves, Esmeraldas, Betim, Ibirité an Belo Horizonte. The elevation o the ceety haw is 939 meters. Accordin tae estimates frae 2008 the municipal population wis 617,741 makkin it the seicont maist populous ceety in the state o Minas Gerais, efter Belo Horizonte. The population is vera young wi 86% o the population bein less nor 50 years auld. Wikimedia Commons haes media relatit tae Contagem. This page wis last eeditit on 6 Apryle 2018, at 20:57.